XM Forex Broker Review 2019 - Is XM a Trustworthy Site for Trading FX? When it comes to choosing a Forex broker, something that attracts many new customers is the promise of something for nothing. Those of you reading this XM Forex broker review will be pleased to learn that at the time of writing, XM are offering all new customers a $30 free XM bonus. And that’s not all. They’re promising the opportunity to trade Forex, stock indices, oil and gold, using the popular MT4 trading platform, leverage of up to 888:1, and an additional XM bonus of $5,000. So let’s fill you in on who this brand name is, and whether they are worthy of your time. The name behind XM is Trading Point of Financial Instruments Ltd, which is a licensed and regulated broker with CySEC and the FCA (Financial Conduct Authority) in the UK. Headquarters are in Limassol, Cyprus, and since the very beginning it has gainED a great reputation because of its core values of transparency, professionalism, and top quality trading conditions. XM is authorized to operate throughout the European Union, as it is registered with various other regulatory bodies such as BaFin in Germany, and CNMV in Spain. It does not currently offer its services to residents of the USA, North Korea, Iran, Myanmar, Cuba, Sudan, and Syria. XM has plenty to offer both new and regular clients, and you get a feel for their professionalism and high standards when you first take a look at their website. Slick, informative, and not afraid to give all the details, it certainly caught the attention of those of us researching for this XM review. XM offers something pretty unique, and that is the 888:1 leverage. But don’t forget that leverage can work both ways, as in Forex trading there are opportunities to both win and lose big. There are a number of other attractive qualities such as no re-quotes, no rejections of trading orders, a range of assets for trading such as precious metals, stock indices, energies, as well as Forex. Minimum deposit is a mere $5, after which there are more than 60 currency pairs, and 100 financial instruments available for trading. XM Forex broker offers a wide array of trading platforms for those who open demo and real accounts, but the most popular is by far MT4. 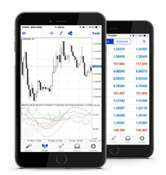 MetaTrader 4 supports an unlimited number of real and demo accounts, as well as Expert Advisors. The available trading platforms support market, limit, stop, and trailing orders, all accessible from 1 account. Which means that trading operations are swift and flexible. Whatever time, and wherever you might be, XM is open for business. There are three basic options if you want to open an account with XM, which are a Micro, Standard, and XM Zero account. The Micro account is great for the beginner, and those who prefer a low risk approach. All that is required is an initial deposit of only $5. The next account up is better suited to those with a little more experience, although the benefits are pretty much the same as the Micro account. The minimum deposit for an XM Zero account is a little bigger at $100. And let’s not forget the account that is perfect for those just starting out in the Forex trading business and those wanting to try XM out for size. There is a demo account available where traders can test their true trading potential, without risking any real cash, before moving up to a real money account. XM Forex broker has gained quite a reputation for a number of reasons and one of them is their very generous set of bonuses. First, there is a $30 no deposit bonus which is available to all new clients, and their site says all profits earned can be withdrawn, and there are no hidden terms. There is also a 100% bonus upon executive level entry to the XM Loyalty Program, that is instant and automatic. The XM bonus amount can be maximized according to level of trading. And finally there is a monthly opportunity to win $50,000 and gain entry to the final round of the Forex World Championship. Prizes include $500,000 in cash prizes, and 12 rounds of $1,000,000 in prizes. We should also mention the XM loyalty program, with its own set of rewards and incentives, as well as free VPS services, and 0% fees on deposits and withdrawals. An important factor to consider when writing any Forex broker review is the quality of customer service and support. XM offers multilingual personal account managers at the disposal of both real and demo account holders. Contact can be made by telephone, email, or live chat. 24 hours a day, 5 days a week. Beginners will be pleased to learn there is a whole library of educational material, including weekly interactive webinars, free video tutorials, as well as Forex news and market analysis. There is a lot to be said about the high standard of security for payment methods, as well as negative balance protection, no re-quotes, no hidden fees or commissions policy. All major payment methods are supported, including WebMoney, China UnionPay, Visa, Mastercard, Skrill, and Western Union. All in all, XM is a very transparent brokerage firm that serves its customers with professionalism and integrity. There are heaps of favorable reviews to read if you want to learn more about them from their customers.